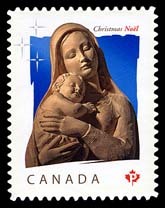 Canada Post began issuing a new stamp for the Christmas 2010 season on the 1st of November. The stamp features the traditional interpretation of the Madonna and Child. The image was photographed from a lime wood sculpture by Antonio Caruso, a renown Italian-Canadian artist. The sculpture, called «Our Lady of the Night» is very much admired for the gentleness and tenderness that it conveys.